The August read on builder sentiment continued its slow rise to a nine plus year high of 61, up one point from July. The index has been at 60 or more since June and above the tipping point of 50 since July 2014. Components measuring current and future home sales also rose to or remained at new heights not seen since late 2005. The current sales index rose one point to 66 and the expected sales component remained at 70 after rising to that level in July. Regional indicators (as measured by a three-month moving average) also rose or remained at heightened levels. The Northeast remained at 46; the Midwest rose three points to 58; the South rose two points to 63 and the West rose three points to 63. Even with the slow rise in confidence, builders continue to face difficulty obtaining lots to build on and labor to build the homes. Prices are rising for both inputs putting some profit squeeze on builders and making it more difficult to build affordable homes for first time buyers. While existing home prices have risen, they have not risen enough to compensate builders for the added supply costs, particularly land. 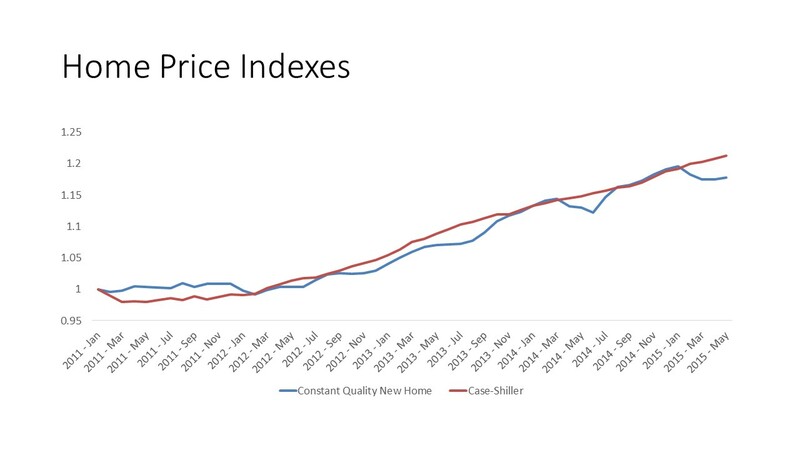 While actual sales prices of new homes have been rising because of the compositional shift, quality constant new home prices have risen less than quality controlled existing home prices. This trend is likely to shift to higher new home prices in order to induce more builders to build. ‹ How Long Does It Take to Build a Single-Family Home?